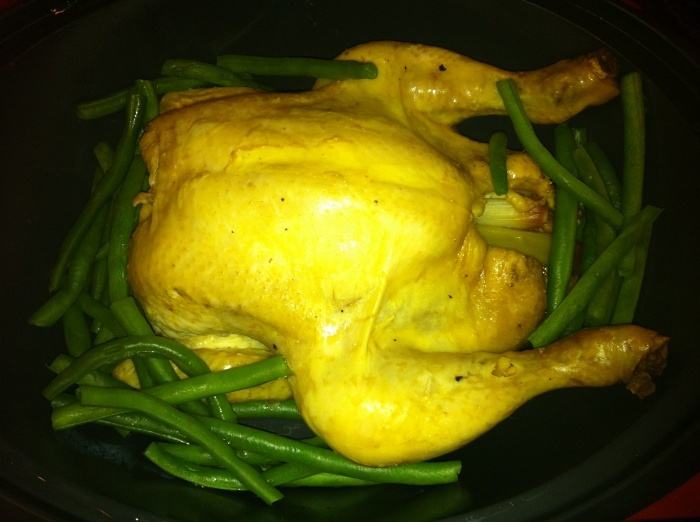 I first saw this recipe over at www.ironchefshellie.com on a “Thermomix Thursday.” I thought cooking a whole chicken in the thermie sounded just too good (and for that matter, too tasty) to be true, so I had to give it a go myself! Mix 1-2 teaspoons Chinese wine, a little salt and pepper to taste and 1 teaspoon sesame oil in a small bowl. Rub this all over chicken and inside the cavity. Stuff 2 cloves of garlic, spring onion/shallot and 2 slices of the ginger inside chicken’s cavity and place into Varoma dish on top of a pair of chopsticks to help steam circulation. Set aside. Place remaining garlic, ginger, eschalots and oil into TM mixing bowl. Chop on speed 8 for 8 seconds sauté for 2 minutes, Varoma, Reverse, speed 2. Add rice and sauté for 2 minutes at 100C on Reverse speed 2. Add about a teaspoon of salt or to taste. Remove and set aside in basket. Place 1L of chicken stock into TM mixing bowl. Set Varoma into position and steam for 25-45 minutes on Varoma speed 3 (depending upon size of chicken used). 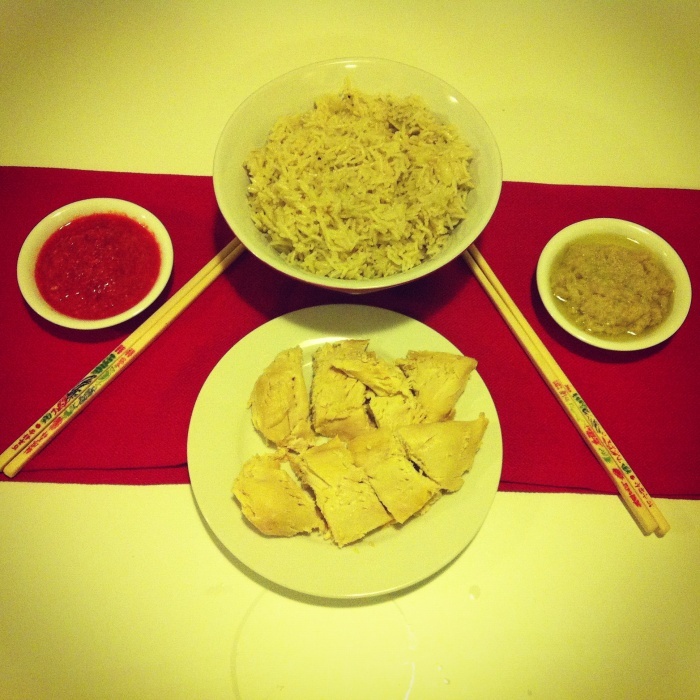 Chop up chicken and serve with rice and Chilli Sauce, Ginger Dip and thick black soy sauce. TIP! ATo make a quick sauce to pour over chopped chicken, mix 3 tsp soy sauce with 2 tablespoons hot water, ½ teaspoon sesame oil and ¼ teaspoon sugar and mix well.